while fat drips away. Not only is cooking vertical healthier . . . it takes less time! Once you have experienced it you will never cook any other way. they're all 100% natural, and so good! All our products include complete instructions and recipes. You are buying the original and there is a difference. We created this product category. All our products are either function or design patented in perpetuity, along with our trademark name "Spanek" and other trademarks world wide. The Spanek™ Vertical Roaster™ is guaranteed to produce crisp, juicy poultry with less work. Every vertical roasting product below no matter what size is designed to perform a specific function on your whole poultry and roast it perfectly. The Eiffel Tower design sears the bird's inner cavity locking in natural juices, while fat drips away. Not only is cooking vertical healthier ... it takes less time! Once you have experienced it you will never cook any other way. Click the links in every product offering for additional tips, frequent questions and answers and multiple discounts. Order more than one of any specific size and receive multiple discounts, it helps save on freight. As you check out, you'll see a drop-down box that lets you conveniently "ADD ADDITIONAL UNITS' — as many as you wish. What makes the product work? Click to find out! And if you're cooking with the Spanek Vertical Roaster, you just have to try our seasonings — they're all 100% natural, and so good! A MUST for every kitchen . . . the basic survival kit! guaranteed juicy, tender, flavorful results. For our complete roaster kit, click here! Also fits duck, and great for small capons and pheasants as well! Check out how to roast the best duck you've ever tasted in this little mini-movie! TWO for a romantic dinner -- FOUR or more to entertain! and are easy to prepare! YES, it does fit in your oven ... the bird sits down! Best of all -- it cooks in HALF the time. Great for BBQ. Fits up to a 20-lb. turkey, but check this out: Two birds x 15 pounds equals 30 pounds of meat ... 2 drumsticks and twice the dark meat! Here's how! Also fits goose — get fantastic results with our special tip-sheet! Once you get it . . . you will never forget it! Or ... "TRY-ME!" — Add two chrome finish Veggie Racks to any Vertical Roaster order for just $8.95! Reversible and collapsible ... for perfect results! Heat, glaze and present your ham using this rack. Works with all varieties of roasts! Reverse the rack to cook whole or half hams too -- great for spiral-sliced. TRY-ME! 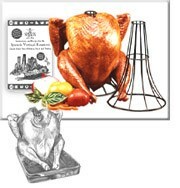 — Add a Roast Rack to any Vertical Roaster order for just $9.95!